I don’t know that I’ve ever formally expressed my thoughts on cab drivers. 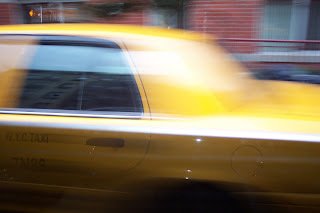 This week I had the opportunity to experience a NYC cab ride and a Chicago cab ride in the same day with very different results, so I think my opinions are ripe for sharing with you, my faithful readers. I despise cabs in New York. There’s not a word strong enough to express my loathing. If I had to pick one thing about the city that I can’t stand, it wouldn’t be summer sidewalk stench, it wouldn’t be bums and it wouldn’t be the constant threat of terrorism. It’s those yellow death rockets known as NYC cabs. Every time I wave to signal a speeding yellow fear machine, I take my life into my hands. I used to think driving on I-85 in Atlanta was risky, but now I look back on those high-speed memories with warm affection. Each NYC cab ride seems more harrowing than the last, even when I’d swear it wasn’t possible to get worse. One ride in particular comes to mind, when Vicky was here earlier this year… her husband called mid-cab ride and the first words she said, through tears, were, “I love you!” because there was a very real chance we wouldn’t make it. There was the time when I had just bought my new phone, and though seatbelted, I was chucked so violently about the backseat of the car that the phone slipped out of my oft airborne bag. I was so nauseous when I got out that I didn't notice it on the floor of the dark cab. To demonstrate the danger of taking cabs, I did a bit of research. On Streetsblog.org, I found this unsettling statistic: 477 people have been killed this year on NYC streets, 19 of them this week. Not all were killed by cab drivers of course, but a great many of the deaths are attributed to them. I'm not exaggerating when I say I fear for my very life and I'd rather ride with RaeRae driving, so I do try to walk or take the subway as much as possible. However, exiting the city requires a 45-minute minimum cab ride, and while traveling on my company’s dime requires a car service ride instead of a generic yellow cab ride, it makes little difference. All New York City drivers are bloody flippin' nuts. Thursday’s ride to JFK was a jerky jumble of stop, go, stop, go, slam on brakes, speed up for three feet, slam on brakes, speed up, turn at high speed, slam on brakes, honk, curse, speed up, flip the bird, slam my face into the seat, etc. I get nauseous when riding in any backseat, even in Florida with my parents, and I used to think they were crummy drivers - until I moved. In NYC, I’ve never actually gotten sick, but by the time I arrive at the airport, I’m always green, I can’t breathe, I feel like dying and I’ve got a bad attitude – which is not good when the security folks are looking for someone suspicious to strip search. Hurtling around corners and catching air at intersections, I can’t help but conclude the cabbies drive maniacly on purpose, which, in my opinion, is a form of terrorism. I’m terrorized, aren’t I? I’m not sure where they were taught to drive like this, but I imagine the Middle East's streets are filled with wild-eyed kooks, snickering ominously, trying to get to the next stoplight as quickly as possible, running each other off the road and making passengers throw up. I just want to know why? Obviously the cabbies don't give a golden hoot about their passengers, but driving 60 MPH for six feet can't be healthy for their cabs. What's the big rush anyways? I remember learning in Driver's Ed that speeding will only make a difference if you're speeding a long distance over several hours. For instance, driving 60 MPH in a 40 MPH zone for 10 miles won't get you to your destination fast enough to make it worth the speeding ticket. The same applies to NYC cabbies... the traffic is so thick that it's certainly impossible to get anywhere any faster by driving 60 MPH down one block, because the next one will surely hold a truck unloading, or some nuns roller skating in the street (I've seen it!!) or a stoplight. Alas, I’m a problem solver. I’m not here to simply air my grievances without offering up concrete solutions. So here’s the plan: citizens of NYC, next time you’re in a cab and you're flung about the backseat by a madman from Cabjerkistan, just let the vom fly. Yes, I know that’s nar-sty, but enough is enough! We must take our own safety seriously, and if I have to barf in every cab in NY to make this world a safer place, so be it! That's patriotism. The best part about this blog is the title. Perfection.